The building is impossible to miss and the point of it is abundantly obvious. But that’s by design. The massive 450-foot tall guitar-shaped hotel at the Seminole Hard Rock Hotel & Casino Hollywood rises so high and is so big it can be seen from Florida’s Turnpike and I-95. It’s a new addition to the skyline from both Broward and Miami-Dade counties. The unique architecture drives the point home: you have arrived at the Hard Rock. 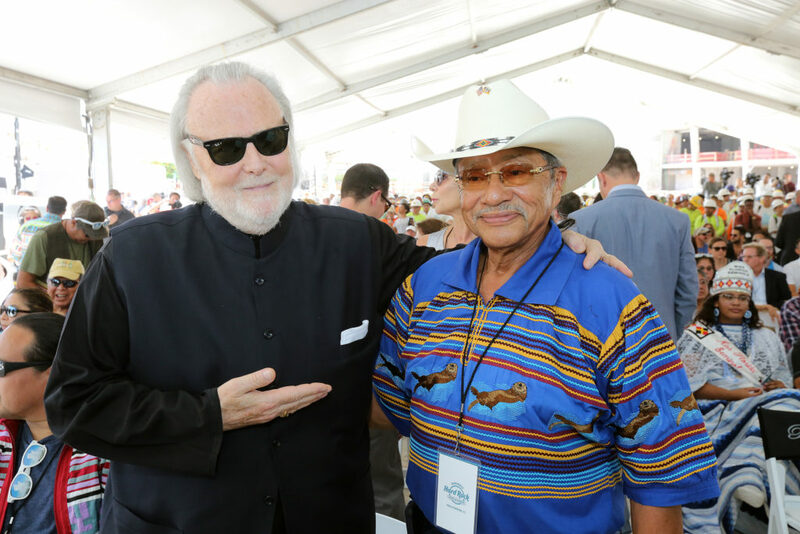 There’s no other structure like it in South Florida, and that’s what Hard Rock International Chairman and Seminole Gaming CEO Jim Allen had in mind from the get-go. The idea to build it began germinating in 2006, he says. 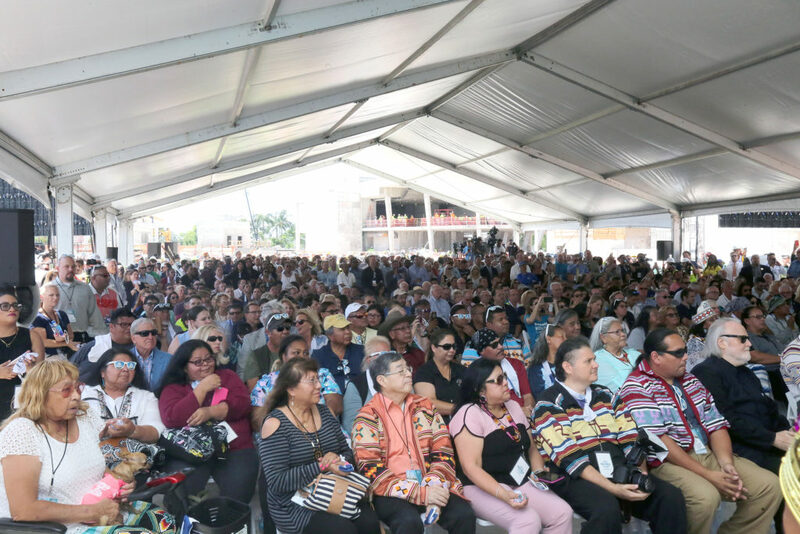 So it wasn’t a surprise when hundreds turned out July 9 for an event under a large white tent in the shadow of the building to see the last structural beam be raised to the top. Top brass from the Hard Rock joined Allen at the ceremony, including the project’s contractors and design crew. 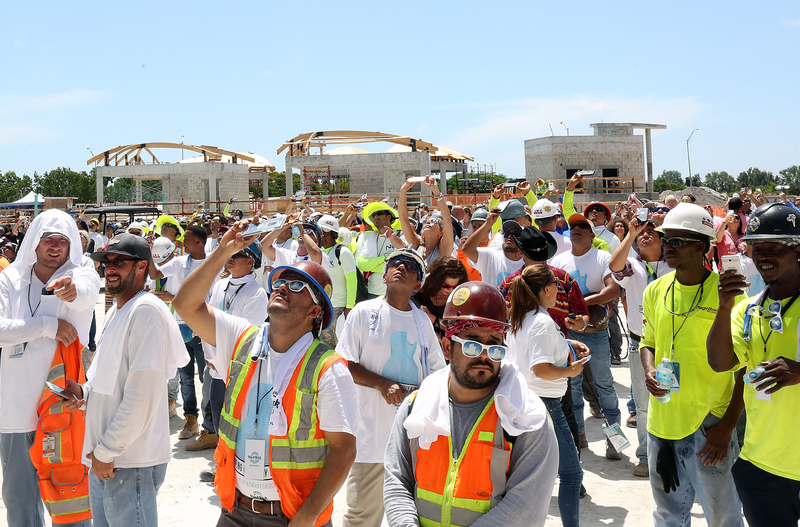 The raising of the beam was a ceremonial step: a way, said organizers, to show gratitude for the hundreds of construction workers who have been toiling away on the project for many months. The construction workers were at the event in force – wearing their white and yellow hard hats and other gear. 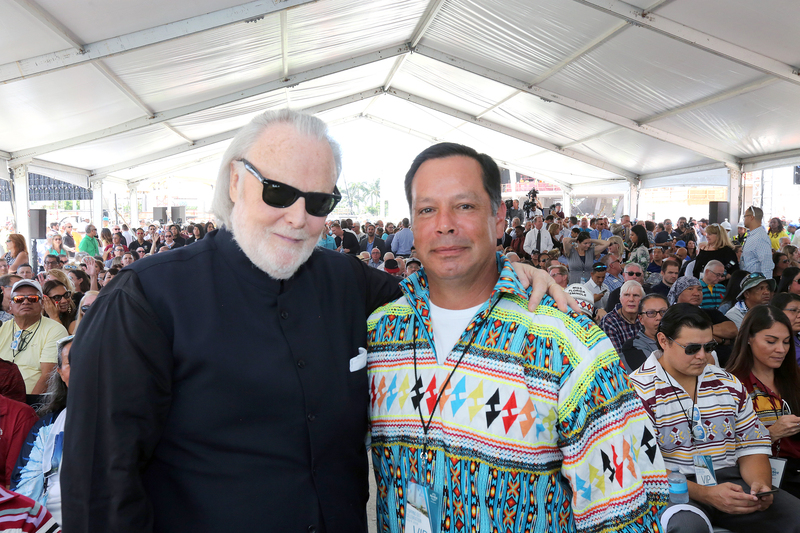 It was a hot and muggy late morning in Hollywood, but Tribal members and leadership, government officials and Hard Rock executives joined the construction workers to mark the occasion and watch the beam rise. The whitewashed beam had made its way through Seminole reservations for about a month so Tribal members could sign it. 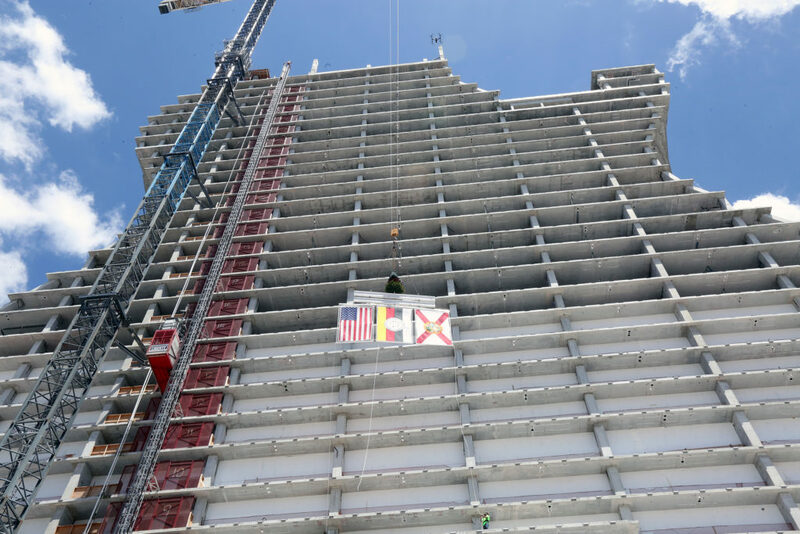 At the ceremony, the beam was raised with the flags of the U.S., State of Florida and Seminole Tribe of Florida – hoisted hundreds of feet into the air by a large construction crane. There was also a small tree on top, a Scandinavian tradition that celebrates newly completed buildings. The event marked a milestone in the $1.5 billion expansion of the property, located at 1 Seminole Way. The goal for completion is the fall of 2019, ahead of the highly anticipated Super Bowl LIV at Hard Rock Stadium in Miami Gardens in February 2020. The expansion began in 2017. The new hotel will have a bevy of amenities among its 638 rooms. The existing hotel, which was built in 2004, has 469 rooms and suites, bringing the total number of rooms to 1,107. A pool tower will feature 168 of those rooms, overlooking a private cabana area. The total number of rooms will cement the hotel as one of the largest in all of South Florida. The new property will also feature 141,000 square feet of meeting space, 3,267 slot machines and 178 table games. The new slots and games account for almost one-third of the expansion of the casino. Other amenities include a new 41,000-square-foot Rock Spa; the 10-acre lagoon-style pool with Bora Bora-style cabanas in the center; private villas with plunge-pool access and butler service; water-sport activities like paddle-boarding; a day club; and a private pool area. The expansion will offer many new restaurant and retail options as well. One of the most anticipated features of the new project will be the almost 7,000-seat Hard Rock Live concert venue, which will include its own television studio and broadcast center, so the property can host its own awards shows and special events. At the event, Allen and others touted the affect the project will have on the economy, and what it’s done for it already – creating 2,000 construction jobs and eventually thousands of permanent part-time and full-time positions. Allen said the $1.5 billion dollar expansion project is just part of the overall economic impact on South Florida, which is “literally hundreds of millions of dollars,” Allen told the media at the event. The Hard Rock empire has grown aggressively since the Seminole Tribe of Florida licensed the rights to the brand for its Hollywood and Tampa properties in 2004. The Tribe purchased the company in 2006 for $965 million. The brand is now in 75 countries. Just last month the Hard Rock Hotel & Casino Atlantic City opened after a $500 million renovation of the former Trump Taj Mahal that closed in 2016. And the Seminole Hard Rock Hotel & Casino Tampa is undergoing an impressive $700 million expansion of its facilities. Hard Rock International recently moved its headquarters from Orlando to Hollywood. The guitar shape will be exclusive to Hollywood until at least 2020, when Hard Rock looks to open another hotel with the unique shape in Barcelona, Spain. Allen said two other guitar-shaped hotels are in the works as well. He offered a clue to the media about where one of them might be. “Brush up on your Japanese,” he said.